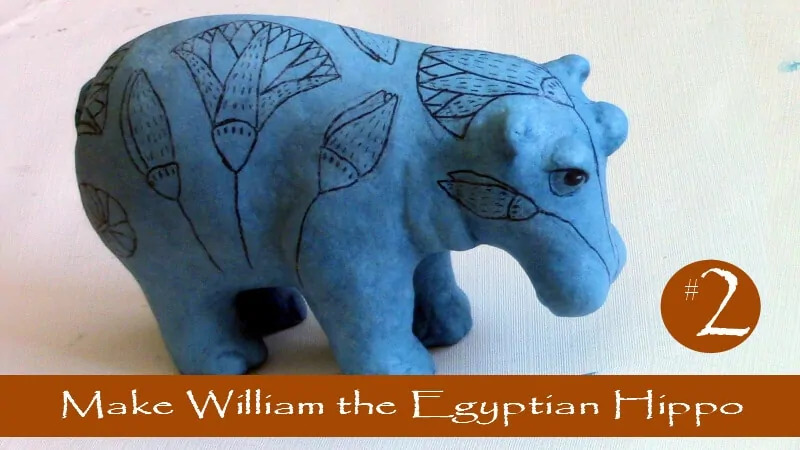 This is the second video in this three-part series, showing how I made a copy of William, the blue Egyptian Hippo that is displayed at the Metropolitan Museum of Art in New York. 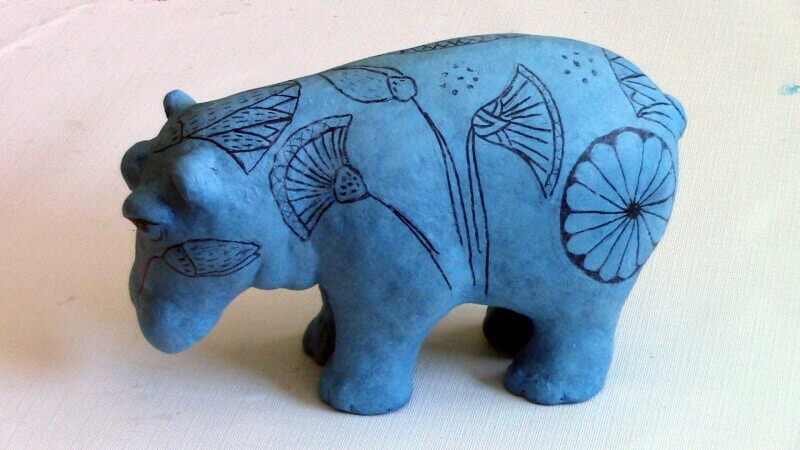 He got his name from a children’s book that was written in the 1930’s, featuring the famous little blue hippo. Click here for the pattern, and the first video showing how the armature was made. In this video you’ll see that the paper mache clay batch I used is much wetter than the original version, but more or less by accident. It worked out really well, though, because the wetter PM clay, along with the mixture of Elmer’s Glue-All and water allowed me to put on a paper-thin layer of the clay, and get it nice and smooth. I’m really happy with the way it came out. I mixed up just half of the paper mache clay recipe, and still had lots left over. It would be really fun to mix up a whole batch and invite a few friends over to make hippos with you. Creating the armature and adding the paper mache clay was a full one-day project for me. 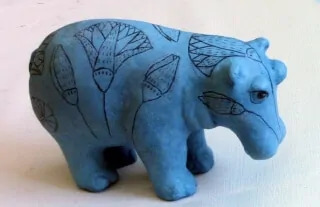 Then the PM clay needs to dry – if you do this with friends, let the hippos dry for a few days or even a week, and then come back and add the coat of blue chalk paint and the lotus flowers. It would be really fun to see how differently they come out, even though you’re all using the same source photos. No two would ever come out alike. If you decide to try using your convection oven to dry your Blue Hippo, be sure to keep the temp low, no more than 100° F (37° C) so you don’t burn him. You’re just drying him, not baking him. If you don’t have a convection oven with a fan inside, just put him in front of a regular fan, or over the heat register from your furnace. The important thing is to keep the air moving. Click here to see how I gave my copy of William the Egyptian his blue coat. William, seen from the other side. If you make your own copy of William, remember to come back and show him off. We’d love to see how he turns out. Thank you Jonni for your recommendation to me about the mermaid wall sculpture I’m planning. Your hippo videos showing the use of tinfoil, and the clay paper mache recipe seem to me the perfect combination. The solution of applying these to a foam board was genius. Thank you so much and I will send you my finished project as soon as I get it completed! It will be easier for me to finish it at home now since your idea of the foam board. Good luck with it – I can’t wait to see how it comes out! I’m watching the video again. At 6.35 mins, you equate 200F to 37C. That is wrong. 200F = 93C. Yes, you’re right! Oops. Thanks for catching it. Water boils at 212° F so 200° F seemed high. This has probably been noted before but 200F is pretty hot. I think 100F is okay. Thanks, Barry. I haven’t had any problems with the oven set at 200° F, but I do watch it carefully and I have a fan in the oven that helps dry paper mache faster. But don’t walk off an leave paper in the oven, no matter what the temperature! Oh, what I wanted to say was that I looked up William the Hippo online and there was a photo of you holding your William. Yeah! What fun! I wonder if it was because Google knows how often you visit this site? Well, I watched Video 2 again. You owe me $45 for the mouse sander! lol. I saw you using that and Teca and I ran down to the hardware store. I asked the clerk if she had ever heard of such a thing, and she said, “That’s what I use. Yes, we have them.” I’m excited to give it a try. I work on the hippos every day. The body went fairly quickly, but the toes gave me trouble. I ended up making each toenail one at a time and letting them dry in between. The face is giving me a run for my money, but I hope to get them finished in the next day or two. I love the process of adding clay onto aluminum foil. My sister is helping her grandkids make a volcano with running lava, and I told her about using the foil. It will be much easier making a river out of foil than paper and masking tape. Thanks for your continued explorations! Boy, I sure hope you like using your new sander, or I’m in a heap of trouble! And I hope your sister likes using the foil. I find it a lot easier than the crumpled paper, mostly because I don’t have to fight with getting the masking tape off the roll while the paper unfolds itself. And the glue sticks seem to be less expensive than masking tape, although it’s hard to compare the two. By the way, have you already told us why you’re making three Williams? Have you already found homes for all of them? I thought they would be wonderful Christmas presents. (I’m always late and tend to give things whenever the mood strikes me instead of holidays — like birthdays, Christmas, etc.!) I’m making one for a sister, one for my good friend on the Isle of Man, and one for me. I’m also making a 4th one for Cathy to paint because she said, “Oh, I’d love to paint a hippo.” By the way, a couple trees were cut down last summer, and I cut some of the limbs into about 2″ depths, sanded them, and gave them to Cathy. She is now painting them using acrylic paints and Prismacolor pencils. It is stunning. I’ll have to get a photo and post it for you. 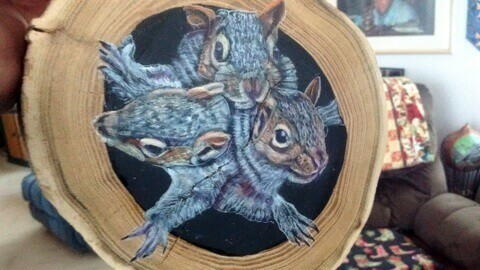 She painted three squirrels. I am working on the hippos ear-by-ear and eye-by-eye. Almost finished. I think one more day of adding clay and I ought to be ready to sand. Thank you so much for that. I just know that the mouse sander with that pointed edge will be much easier than the “round” sander I use. Usually I give up and just use sandpaper. Rex, I can’t wait to see those wooden rounds Cathy painted, and all four of your hippos. Are you and Cathy going with the Egyptian traditions, or will you add your own creative spin? It is warming up a bit this week here in MN. I just hope my baby peach tree survives the weather. I’ve got my fingers crossed. Do you put Teca in a sweater when you go out for your walks? Here is a photo of the wooden round Cathy began painting. I’m sorry it is such a bad photograph. I took it with my phone and the light was bad. Hope you get the idea. I hope your peach tree survives also. When I lived in the Uintah Basin, fruit trees died all the time during the winter. It would get -20 to -40 often. Cathy’s painting is beautiful. The squirrels look young and playful. She must have had great fun painting them. Yes, I put a coat on Teca. 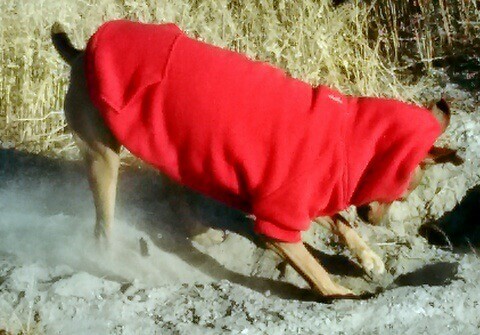 Here is her digging. If it gets below 20, I put an “undershirt” on her also. She gets cold easily. Even though we walk for an hour or more, she knows she’s getting a warm blanket when she gets home (from the dryer, yes). Notice the dirt flying. This is where we walk. She has lost her coat four times. I have found it three of the times. 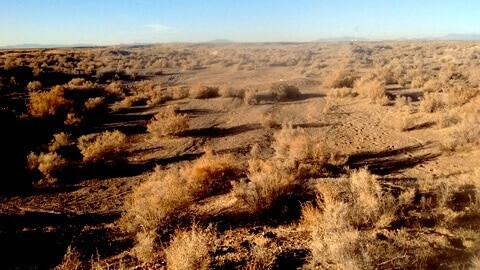 Two days ago she ran off into the wilderness (you can see her in the photo as a dot in the center) and the coat came off. She gets caught in the sagebrush and pulls it off to get out. I’m not sure if we will find it this time. Luckily I have two more just in case! Made clay tonight and finishing the clay on three hippos tonight. Am beginning the base coat on the 4th. I don’t know what Cathy plans on doing with hers. I will let you know. I plan on following your tutorial on mine. Will get out the sander tomorrow. That photo looks like much of the land where I grew up, in the Scablands of Washington. The first thing I thought when I saw your photo was “rattlesnakes,” although I never worried about them when I was a kid. There must be some wonderful lizards hiding out there, and creepy-crawlies, too. I can see why Teca enjoys it so much. Let us know what you think of the sander. I used a really fine grit to keep from cutting all the way through and hitting the foil. Here are the three hippos that I have started. My main concern at this point is that they look more like bears than hippos. As you can see, I haven’t added clay to the eyes or ears yet because I’m not sure if they ought to be moved. Any suggestions? HELP! The clay went on so smoothly I was shocked. I have about two tablespoons left and am afraid the next batch will not nearly be so perfect. Three of them! Boy, you don’t mess around, do you? My suggestion is to leave the ears and eyes exactly where they are now. That’s how the original hippo in the museum looks. See original here. Thanks. I love the gazelle on that page! Appreciate your time and talents. Here is a photo of the hippos with clay and gesso on them. The only reason I’m posting this is because I don’t know how they all came out so different when I used the same pattern for all of them. There is a lesson in there someplace. The last one I finished was the “whiter” one. I think the head is more accurate. Now I’m wondering if I should remove all their heads and begin over. I looked through the photos that I printed out and realized the one of a head-on view is different from the other ones. I don’t know if that is the problem of not. Anyway, for what it is worth. They all certainly have different characteristics. I think the one of the left will go to my friend on the Isle of Man (British Isles). The next one to the right Cathy is going to paint. I don’t know about the other two. Now to get brave and face the painting challenge. I can’t decide whether to go with a warm blue (Ultramarine) or a cool blue (Cerulean) for the base. I would like to go with your turquoise feel, that’s why I’m considering the cool blue. I will paint a bit on a scrap of paper like you did. That is a good idea. He seems a little fat, but we’ll see. The little bitty feet took longer than all the other armature. ??? Now to add the clay. I had so much fun today watching videos 1&2! I had watched 1 before, but I wanted to refresh my memory! It is certainly different using a glue gun and aluminum foil. I have the legs and flat part of the body finished, so I’ll be making the belly and sides and face tonight. Fascinating watching you put clay on aluminum foil. Thank you so much. William is a beautiful little creature. I’m so glad you decided to make William – I can’t wait to see how it.